Caleb Sturgis kicked a 21-yard field goal with seven minutes, 41 seconds to play to give the Los Angeles Chargers a 29-27 victory over the San Francisco 49ers on Sunday after missing two extra points and a 54-yard field goal attempt. San Francisco had two chances to regain the lead. The first ended after they were forced to punt after three plays. The second ended when C.J. Beathard’s pass was intercepted by defensive end Isaac Rochell at the 49ers 23-yard line and the Chargers ran out the remaining 2:31. “I think it was just a gritty team win,” Chargers quarterback Philip Rivers said. “It wasn’t the best day, but at the same time, we showed some of the traits that we always talk about having — toughness, togetherness, the fight. “The defense stepped up big in huge ways. We struggled coming out of the gates, then we settled in and kind of got a groove there for a while, and then kind of got in a little bit of a rut. We found a way to win. San Francisco (1-3) had taken a 27-26 lead with 12:39 left on Robbie Gould’s 33-yard field goal, his 33rd consecutive successful attempt. Rivers completed 25 of 39 passes for 250 yards and three touchdowns with one interception and Melvin Gordon ran for 104 yards on 15 carries for the Chargers (2-2). Beathard completed 23 of 37 passes for 298 yards and two touchdowns with two interceptions. Beathard started in place of Jimmy Garoppolo who tore an ACL in last Sunday’s 38-27 loss to the Kansas City Chiefs and will miss the rest of the season. The Chargers led 368 yards to 364 and 32:26-27:34 in time of possession. The 49ers led 22-21 in first downs in the game at the 27,000-seat StubHub Center whose paid attendance was 25,397. The Chargers broke a 17-17 halftime tie on their first possession of the second half when they drove 51 yards on six plays with Rivers throwing a 6- yard touchdown pass to Gordon. Rivers and Gordon accounted for all the yards on the drive with Rivers completing two of three passes for 30 yards and Gordon running three times for 21 yards. Sturgis missed the extra point. Sturgis increased the Chargers lead to 26-17 on their next possession with a 25-yard field goal, four plays after cornerback Trevor Williams intercepted a Beathard pass at the Chargers 2-yard line and returned it 86 yards to San Francisco’s 12-yard line. Following an exchange of punts, Beathard threw an 82-yard touchdown pass to tight end George Kittle, a teammate at Iowa. 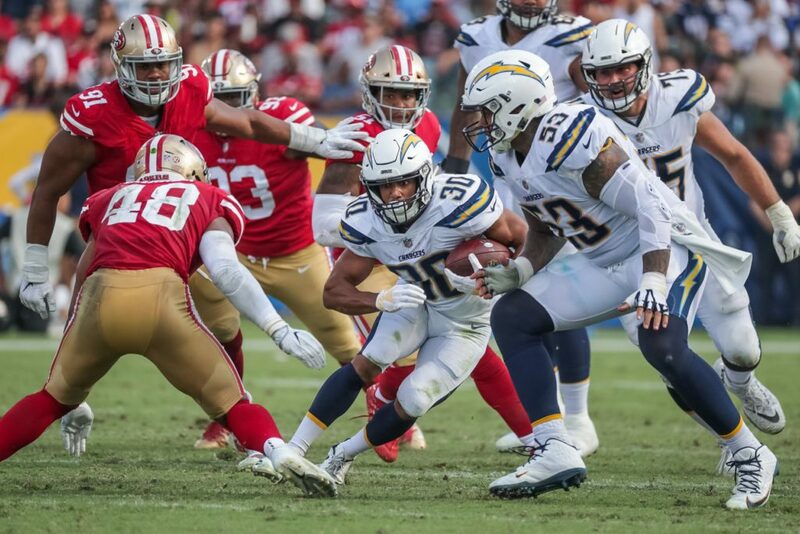 The 49ers opened the scoring 57 seconds into the game when Antone Exum intercepted a short pass by Rivers and returned it 32 yards for a touchdown. The interception was Exum’s first of his three-season NFL career. San Francisco increased its lead to 14-0 with 3:53 left in the first quarter on Beathard’s 2-yard touchdown pass to Kendrick Bourne. The Chargers scored their first points with 43 seconds left in the first quarter on Rivers’ 5-yard touchdown pass to Antonio Gates. Rivers completed six of seven passes for 71 yards on the seven-play, 75-yard drive that also included a four-yard facemask penalty. The 49ers kept the ball for 10:44 on their next possession, driving 72 yards on 21 plays and a penalty culminating with Gould’s 21-yard field goal 4:59 before halftime. The Chargers tied the score, 17-17, with 11 points in the final 47 seconds of the half, beginning with Rivers throwing a 22-yard touchdown pass to running back Austin Ekeler and completing a two-point conversion pass to Gordon. The Chargers forced San Francisco to punt after three plays. Desmond King, an Iowa teammate of Beathard and Kittle, returned Bradley Pinion’s 55- yard punt 56 yards to the 49ers 32-yard line. Sturgis kicked a 48-yard field goal three plays later. The punt return was the third of King’s two-season NFL career. The previous ones were for 2 yards last season and -1 in the first quarter. “He did a nice job today,” Lynn said. “We’ve seen Desmond do that before, so I wasn’t surprised. He broke two or three tackles. He’s a strong, young man. King said he was told Saturday he would be returning punts. Lynn said he was “absolutely” disappointed by Sturgis’ performance but was non-committal about whether changes would be made. Rivers’ 250 passing yards gave him 51,504 for his career, passing Hall of Famer John Elway for eighth on the all-time list. Elway had 51,475 in his 16 seasons. “Those are guys I had posters of on my wall, so just to be mentioned with those guys is definitely special,” Rivers said.